When you’re busy (who isn’t? ), dusting might seem like perfectionism. It’d be more relaxing to hit the couch and watch some dust motes swirl in a sunbeam, right? Except...those pretty particles are like tiny sponges for toxic chemicals--particularly flame retardants. Research has shown that over time, these tiny exposures add up to a body load of chemicals that have been linked to increased risks of cancer, infertility, obesity, and developmental brain disorders such as autism and ADHD. Babies and children are particularly vulnerable—as are pregnant women. What to do? Don’t panic—just make dust control more of a priority in your home. Here’s how. Seal it up. Caulk around doors and windows and clear ash and dirt from fireplaces and flues. Check dryer flues for leaking lint and seal their exterior vents. Wipe your feet. Minimize tracking in of soil that may be contaminated with pesticides. Bristly mats outside entrances and washable rugs inside reduce dust spread. Many households adopt a "shoeless indoors" routine. A small bench with an array of slippers or cozy socks can welcome guests, with space for shoes underneath. Vacuum frequently. The floor is where dust falls and stays--especially in carpet fibers. Small children touch dust with sticky fingers that wind up in their mouths. Vacuuming twice a week significantly lowers dust levels. Use a HEPA-filtration vacuum cleaner and change the bag when it’s no more than two-thirds full. Change vacuum filters regularly. Sweep often. Sweep any floors you don’t vacuum, every day or two. Discard swept debris in an outside trash can so it can’t migrate back indoors. Don’t forget thresholds and porches. Mop, too. If floors are regularly vacuumed or swept, mopping afterward finishes off dust. Skip chemical cleaners--a regularly-swept floor cleans up beautifully with a vinegar and water solution (add a squirt of natural detergent when needed). Use microfiber dust cloths. These hold dust better than old t-shirts or similar cloths, which mostly shove it around. For non-wooden surfaces, dampen dust cloths slightly. Toss them in the washer after use (skip fabric softeners, which reduce fiber’s ability to grab dust). Freshen beds. Wash sheets and pillowcases weekly--dust collects on horizontal surfaces and you’re in close contact with your bed for long periods. Wash other bedding monthly—especially if a pet sleeps with you. 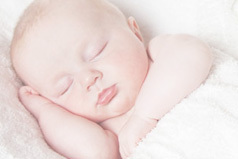 Flame-retardant-free mattresses are the safest choice. Make like Great-Grandma. Homemakers used to whack rugs over a clothesline--they knew where the deep dust was. Take cushions and rugs outdoors several times a year and whack away with a broomstick until you’ve removed as much dust as possible. Choose a breezy day and situate yourself so dust blows away from you. Wear a face mask for extra protection. Wipe down walls. Every few months use a damp microfiber cloth to wipe walls from ceiling mouldings down to the bottoms of baseboards. Catch the windowsills while you’re at it. Nix knickknacks. Every additional object you display means more surfaces for dust. Edit your decor so things you keep out are few enough to keep dust free. Crazy for collectibles? Store most packed and enjoy a rotating display of favorites. Tidy closets. Textiles are dust magnets, and closet floors accumulate dust from shoes. Store out-of-season clothing in well-sealed containers. Keep shoes in hanging bags so closet floors can be vacuumed thoroughly. Groom your pet. Pets shed hair, but they produce dust too. Dust contains skin particles (or dander)—and some pets are prodigious producers. Bathe them regularly and brush them either outdoors or in the kitchen or hallway (not on your couch or bed). Consider an anti-allergen pet lotion you can smooth onto fur to keep dander down. Now that you’re exhausted, have a nap. Hopefully on a non-toxic mattress that renews your strength for maintaining a low-dust home! Mounting evidence suggests environmental chemical exposure may be behind many developmental brain disorders. 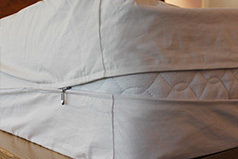 Our mattress allergy encasements block entry of dust mites, pet dander, or bed bugs. Here are two primary reasons to choose organically-grown cotton whenever you can.